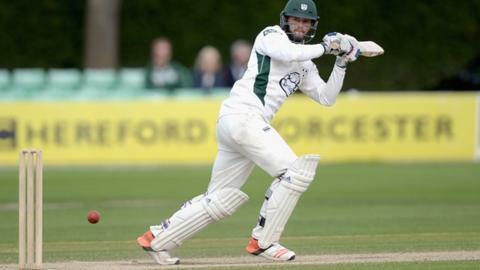 Batsman Ross Whiteley has signed a new four-year contract with Worcestershire. The big-hitting former Derbyshire left-hander, 26, is the second player, after teenager Joe Clarke, to agree a new deal at New Road in the last 24 hours. "I'm really excited about what the next four years holds for me at Worcester," Whiteley said. "I've really enjoyed my cricket over the last couple of years and to have that opportunity to stay for another four years is massive for me." Whiteley arrived at Worcestershire midway though the 2013 season from Derbyshire and has developed into a highly-destructive batsmen in one-day cricket. Only West Indies star Chris Gayle and Chris Wright have hit more than Whiteley's 27 sixes in the group stages of the T20 Blast this season, with Worcestershire's place in the quarter-finals giving him the chance for more. Whiteley hit nine sixes in a 38-ball knock of 84 against Derbyshire in last season's T20 Blast. This season he smashed 11 maximums in making 91 not out off 35 balls against Yorkshire - the most by a Worcestershire player in T20 cricket. In 42 T20 innings he has a strike rate of 149.82 and has hit 56 sixes. He also struck a century against New Zealand in May and notched his first first-class ton since 2011 when he made 101 against county champions Yorkshire at Scarborough in July. "I feel I am progressing as a player. It has been a tough couple of years for me in the red-ball stuff and only recently has that been paying off," Whiteley added. "I just generally think my cricket as a whole is improving and has improved during my time here. Working with the coaches here has been great."